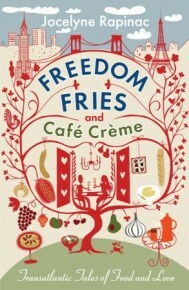 Freedom Fries and Cafe Creme is a collection of short stories by Jocelyne Rapinac that the publishers Gallic Books kindly sent me to read over the summer. Jocelyne is French, but has lived in the US, Switzerland and the UK, so it is no surprise that some of the characters are French, some of the stories are set in France and a lot of the recipes have a French twist – a perfect combination for me! I like short story collections, but they have to pack a punch and give me something to sink my teeth into. I also like the characters to make an impact so I’m left thinking about what might happen to them after we’ve left them. These did just this and I could easily (and probably will) read it again. Even in La Belle France we had the odd less than perfect summer day, but this book was the ideal distraction and great company on the sofa with a coffee and a croissant. I defy anyone to read it and not feel hungry, especially as at the end of each chapter the recipes that have whetted your appetite are thoughtfully included. How often have you read a book where a meal or a dish is so exquisitely described you think how nice it would be to give that a try? I’ll definitely be trying some of these, so many of them seem to be easy to follow, simple but delicious too. I have put the book in a prominent position in my cookery book cupboard – yes I really do have an entire cupboard just for cookery books! My only little niggle was that at times I felt like I was being preached to. Despite being the sort of Mum who chose to stay at home and embrace the whole home cooking is best regime, it still seemed a bit over the top that it was always the ‘Super-Mum multi-tasker’ characters and their poorly behaved (because of it) children who were portrayed in a negative light. However it is still a good read (with great recipes). Happy reading!